Recorded as Holdsworth, Houldsworth, Holdworth and Halworth, this is an English medieval surname. It is locational and originates from either of the places called Holdsworth and Holdworth in the county of West Yorkshire. The places are recorded respectively as "Haldewrth" in the Pipe Rolls of the year 1276, and as "Haldewrde" in the Domesday Book of 1086. Both share the same meaning and derivation, which is "Halda's settlement", derived from the pre 7th century personal name "Halda", from the word heald, meaning bent and used in the transferred sense of a crooked back, with "-worth", a settlement or farm. Locational surnames, such as this, were usually acquired by the lord of the manor, and especially by those former inhabitants of a place, who had moved to another area, and were best identified by the name of their birthplace. The surname was first recorded in the late 13th century (see below), and other early recordings include: John de Halworth in the Poll Tax returns for Yorkshire in 1379; Joshua Holdsworth in the Hearth Tax returns for 1593, also in Yorkshire, Robart Holdworth was a student at the University of Oxford in 1595, whilst Gilbert Holdsworth, aged thirty, was one of the earliest settlers in the new colony of Virgina, sailing there in 1635. 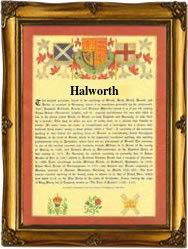 The first recorded spelling of the family name is shown to be that of John de Haldeworth. This was dated 1273, in the "Hundred Rolls" of Yorkshire, during the reign of King Edward 1st, 1272 - 1307. Throughout the centuries, surnames in every country have continued to "develop" often leading to astonishing variants of the original spelling.